Posted on Wed, Jan 5, 2011 : 8:28 p.m.
Former Michigan football coach Rich Rodriguez. Everybody take a deep breath. The two-day hullabaloo created around the firing of Michigan football coach Rich Rodriguez is beginning to settle. All that's left for athletic director Dave Brandon - and Wolverines fans around the country - is to turn their attention to the not-so-small detail of finding a replacement. Just how hot was this story? On Tuesday night, "rich rodriguez" was No. 1 on the Google hot topics list. Coming in at No. 2: "rich rod." â€¢ What's next? Michigan football beat writer Pete Bigelow takes his best stab at answering that question, writing that Jim Harbaugh's name still comes up often for Michigan, even if Brandon thinks he's headed to NFL. â€¢ Talk about a bad week. On the day he was fired, The West Virginia Record reported an attorney sued Rodriguez over the $1.3 million sale of a home in Morgantown, W.Va.
â€¢ Jeff Arnold and other members of the media caught up with players who were saddened after their meeting with Rodriguez and Brandon, but said they plan to stick together. â€¢ Arnold reports that Brandon stuck to his timeline and made a decision that wasn't easy for him. â€¢ Kyle Feldscher speaks with the univeristy's alumni association president, who says now is the time for Michigan football fans to unite. â€¢ Feldscher also reports that Brandon is fully aware his decision to fire Rodriguez runs the risk of unsettling recruits and current players. â€¢ Bigelow shares his top five Brandon quotes from Wednesday's press conference. â€¢ Rich Rezler compiled a series of links to past AnnArbor.com and Ann Arbor News stories to present a timeline of Rodriguez's three years as head coach. â€¢ Also, here are some memorable quotes from Rodriguez's stint at Michigan. â€¢ In our main story from the Wednesday press conference, Arnold shares Brandon's details on how and why he decided to fire Rodriguez. And we have video highlights of the press conference, too. â€¢ Feldscher reports that Michigan football fans had mixed reactions to news that Rodriguez has been fired. â€¢ Mike Rothstein's basketball game-day chat was also heavy on football coach talk. Check out the transcript here. â€¢ Jim Knight detailed Wednesday afternoon's planned press conference. â€¢ In an opinion piece, Bigelow noted after Tuesday's meeting between Brandon and Rodriguez concluded without incident, the coach was "getting a raw deal from the University of Michigan." â€¢ Four hours after their meeting was scheduled to start, and despite media reports to the contrary, Bigelow wrote that no news had emerged from Rodriguez's talk with Brandon on Tuesday. â€¢ Bigelow reported that Rodriguez expected to meet with Brandon on Tuesday afternoon. â€¢ Cindy Heflin compiled an extensive list of links to what other media are saying about the firing of Rodriguez. â€¢ Stefanie Murray took a look at what people were saying about the coaching decision on Facebook and Twitter. â€¢ The New York Times wrote that a messy situation at Michigan will cost the Wolverines recruits, ding its image. â€¢ Kaleb Roedel compiled our daily college sports links and it, not surprisingly, was heavy on Rodriguez stories. â€¢ The New Orleans Times-Picayune reported that Michigan had not contacted LSU about coach Les Miles. Thu, Jan 6, 2011 : 1 p.m.
Where does one send contributions to the destitute football coach fund? Thu, Jan 6, 2011 : 1:15 a.m. If Mary Sue Coleman wants him (Brady Hoke), that's reason enough to run screaming the other way. She exhibits an almost ghostlike presence regarding the football program, and has extremely poor judgment over such things. Recall her very public support of RichRod through the last year or two, despite him publicly embarrassing the university repeatedly. I refer not to his on-field results, also. As you can tell, I'm not a fan of her. Hoke? I don't know enough, but I question his presence. At least with Miles, he worked his way up through several big conferences and has succeeded though he has been flaky for sure. Why Michigan connection is necessary? I think it helps with approaching and continuing a successful franchise started with Bo and let's just throw out the last 3 years which were hopefully aberrations. Michigan did not need rebuilding with a new strategy. They needed refinement. Winning breeds winning, comes as an expectation. Though OSU is talented, the players there just expect it given how long it's been happening and will their ways to win even when odds are against it (and players break the rules yet still get to play). 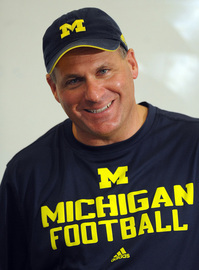 Thu, Jan 6, 2011 : 12:55 a.m.
That smiling photo above, is how we will all remember the end of the Rich Rod Error. Thu, Jan 6, 2011 : 12:18 a.m. I also posted this on a story written yesterday and moved it to here as it may be more relevant- ----------------------- These comments make it appear Mr. Hoke is signed sealed and delivered. Be fun to see how accurate it is and when will we know if it is so.... ******* From Channel 6 news in San Diego Ca. (earlier) "Ermanni ( a reporter is Detroit) told San Diego 6 News, "No matter what the situation is, Brady Hoke will be named the head coach within a couple of days."........ Ermanni said he has had text conversations with those close to Michigan's Athletic Director and President of the school and says, "Michigan's AD, David Brandon, wants/loves Brady Hoke. And Mary Sue Coleman, the president of the university, wants Brady Hoke. ".........We contacted the SDSU athletic department as well as President Stephen Weber's office but both declined comment except to say that Hoke was not in San Diego and not available for comment." Wed, Jan 5, 2011 : 10:56 p.m.
why does the myth of the 'michigan man' persist? why must we continue to insist that every coach have past ties to A2? there MUST be great hires out there that have never coached at the bighouse. problem is that we as fans insist on someone familiar----ex players demand someone that they know. consequently we won't accept anyone without ties to the man who arrived FORTY years ago. current recruits and probably even their parents don't know who bo schembechler was. Wed, Jan 5, 2011 : 10:34 p.m. I don't see the next Michigan hire leaving for a while. I seriously doubt anyone who cares the slightest bit having this bad of a run. I think Les Miles would be a good hire. His personality and gamesmanship are "refreshing", but his ties to Michigan along with his personal moral and work ethics are very strong. Les will personify the "new" Michigan brand by uniting a hybrid pro/spread (maybe with TWO QBs) and this team will win! Oh yeah - he also knows a thing or two about defense! GO BLUE ps. Sorry Rich, you just failed in every way. Man up. Wed, Jan 5, 2011 : 10:25 p.m.
or maybe Harbaugh has a tough go at it in the NFL and comes home to U-M later in his career... time will tell. Wed, Jan 5, 2011 : 9:19 p.m.
You heard it here first! Les Miles is the next coach for the Michigan Wolverines! He is not denying it in any interview! Harbaugh is heading the to NFL. Good for him. I think it is a mistake! If he goes to the 49ers and can not turn them around his hot status goes south! Welcome Les Miles! I hope you are our next Bo!